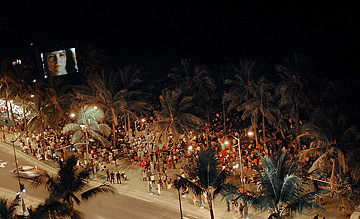 Thousands of people packed Kuhio Beach and lined the barricades for a glimpse of their favorite "Lost" stars last night at Sunset on the Beach, transforming a patch of Waikiki into a bit of Hollywood. 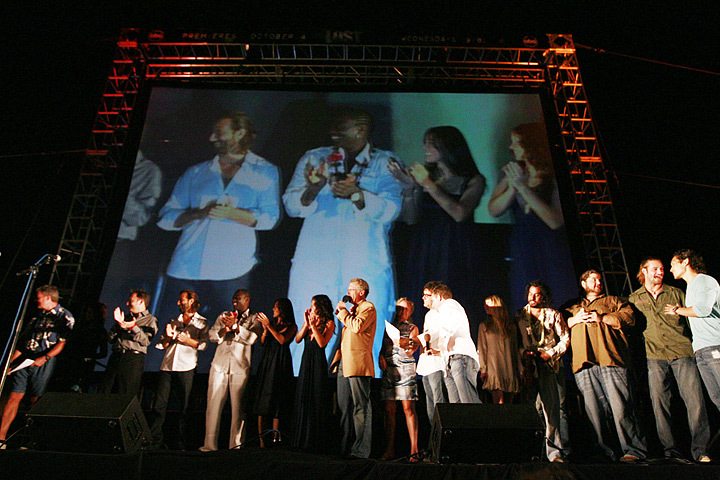 The red carpet (atop a platform in the sand) affair attracted media from around the world, familiar and new faces from the hit ABC series, and devotees of the perpetually mysterious show. About eight seniors from St. Andrew's Priory staked out a prime space against the barricades at 9 a.m. yesterday morning hoping for autographs and photos with their favorite stars. As the sun set, the crowd welcomed every star with cheers. Small group of fans screamed out the names of characters, which usually earned the actor's attention and a friendly visit. The day-long wait paid off for the Priory seniors, who were well rewarded for their efforts when nearly all of the cast members stopped in front of them and they were able to shake hands and get pictures and autographs with many of them. Before everyone settled in to watch the much-anticipated first episode of season three, one of the producers stood on stage and implored the crowd, who would be seeing the season premiere four days earlier than the rest of the world, to "please don't tell anything." "Let's just keep it between us 15,000 people," he said. "Keep it in the family."